EverQuest fans excited for the game’s next expansion should mark Wednesday, November 19th down on their calendars — that’s the day The Broken Mirror launches. Announced during a special reveal livestream, this 22nd expansion revolves around the goddess Anashti Sul (who has been split into her two most dominant aspects of life and decay) and her hunger to return to power and rule. Unfortunately for Norrathians, she plans to unleash plenty of chaos and war throughout the planes in order to achieve her goal. Fortunately for players, this means all new zones, new dungeons, and plenty of new items! If you can’t wait to get the expansion, you can go ahead and preorder it now. However, that does not mean you can play it now (sorry). Preordering will grant players a gift for immediate use. One character on your account will get a Shroud of the Boken, which is an illusion of a cultist devoted to life after death. Anyone wanting to envelope themselves in brown robes with a face-covering cowl will surely enjoy this look! Prices for TBM mirror the EverQuest II expansion that will arrive one day earlier: the standard edition is $34.99, collector’s is $89.99, and premium is $139.99. All versions will give access to the beta, access to all previous expansion content (including The Darkened Sea), and a 10-slot key ring to store illusions, thereby freeing up some valuable inventory space. Devs understand as well as anyone that inventory space is a premium commodity, so this new key ring — much like the mount key ring from before — has been developed to get illusions out of the bag and into one easy-to-access spot. The next tiers add more bells and whistles. The collector’s edition includes a number of per-character items — personal and house-based teleport items to get to the Plane of Health, a new mercenary that grants special benefits when in the expansion, and a house painting — as well as once-per-account goodies — 10 more illusion key ring slots, a skeletal illusion, and a 40-slot bag. The premium adds even more illusion key ring slots (30 more!) and a lion mount with top-notch stats to each account. A full look at all the offerings, including video clips, can be found on the official site. First things first: Even with new content, there are no additional levels! So those who haven’t reached max yet won’t fall even further behind. No level-cap increase doesn’t mean the content will be a pushover, however. There are definite power increases in the expansion, power that players will need in order to conquer the new content. And what is all this new content? I am glad you asked! Have you ever wondered if raid content could scale to level just like the heroic adventures? The devs did, and so they gave it a try. And it worked! The Plane of Hate and Plane of Fear have been retooled to become level-scaling zones, complete with raid content from level 75 on upward. Doug Cronkhite, senior game designer, said that the original Planes (not the newer, updated versions) were the base for these changes. The point was to go for the more nostalgic feel. Even so, the zones have gotten facelifts. The boss fights are more contemporary, having been bumped up in complexity as well as having a little bit more of a twist added to them so “they are not just a bag of hit points that you just beat on all day long.” The Planes of Hate and Fear aren’t only for raiders, either; for those who don’t take part in that gameplay, there will be group content in these revamped zones as well. To get to the action in Hate and Fear, players will travel from Tranquility. Because these two areas now scale, the devs have developed a new system for their loot. Base items will drop as level 75 items; the “better gear” part comes though upgrading. Players will also be earning points as they complete content in those zones, and it is these points which will be used to upgrade the items. As a bonus, by using points players can dictate what upgrades work best for them instead of having to wait for specific stats to drop on an item. Another helpful change: Devs also shared that the problem of aggroing things on a different level was fixed by making it so the mobs don’t spawn on the next floor until the current one was is cleared. Two revamped planes aren’t the totality of new places to roam and explore in within The Broken Mirror. Max-level characters will get to start their expansion experience in the new zone Plane of Health. A unique aspect of this zone is that it has a more decayed mirror image (with correspondingly different NPCs) that players can phase to. Devs explained that players will need to travel between these two aspects and manipulate things in each to accomplish their goals. When you transfer between the two via the broken mirror in your inventory, you end up in the same exact spot, just the different version. Both zones do have their own quests and content though. In total there are three revamped and four brand-new zones to adventure in. Filling these new playgrounds are plenty of quests, heroic adventures, and missions. There are also more raids sprinkled throughout the rest of TBM as well — 15 raids in total according to the dev team. To help players master and subdue this content, there are news spells as well as new AAs. There is a new progressive spell for each class. These spells are, in the words of the devs, very much focused on the core of the class and are very useful and powerful abilities, abilities that grow even more useful and powerful. As players progress through the content, these spell increase in ranks, all the way up to rank six. It should be noted that even though there are new spells, there will not be any new spell slots in The Broken Mirror. For those wondering about power sources, the current ones will work and devs do not have any new ones planned. With so much new content, how about some new threads to traipse around in? There are just times that you want to look good when embarking on your new adventures. That’s where the Heroes Forge comes in. Themed for the expansion in blacks and purples, there are multiple new armors coming to deck your characters out in. One set is available to raiders and one set to those who group, but the devs assure that there are other sets as well that will be obtained in other ways. During the Q&A section after the expansion reveal, devs offered more EQ news. Executive Producer Holly Longdale said that the anticipated no bot/no boxing progression server is planned to be available by the end of the year. This means that each account must be played on its own separate computer. Longdale also noted that the server would have instancing. Additionally, around approximately the third week of October when both the next game update and the expansion’s beta are expected (pending having Internet in the new Daybreak offices), Ragefire players will be getting a new vote to decide if they want to keep to the current six-month content update schedule or move up to three months. And finally, this week’s fall frenzy bonus was also turned on and it bumps up the frequency of rare spawns on live servers by 25%. People pay for this? And up to $140??? Awww, but aggroing the second floor of PoHate was the best part of any raid! Oleg Chebeneev It’s actually 3 new zones, one of the zones has two different instances using the same zone. RicharddeLeonIII Doesn’t really bother me as long as it is non-essential bonuses. This is how free to play games make money. Whales. I love that pic. 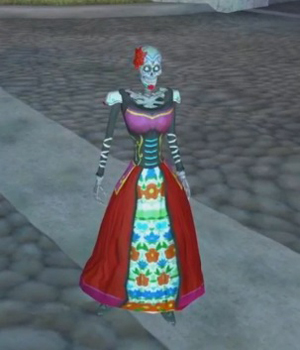 It is a great metaphor for “What can we do to dress up this old skeleton?” Literally dress it up, lol. That said, good for them, I like to see games people love get continued investment. RicharddeLeonIII the other thing they did with this expansion is to tie beta invites to pre-orders instead of just accepting just about anyone with heartbeat who applies. Will be interesting to see if they get enough guilds capable of dev testing via pre-orders of if they will have to invite testing guilds separately.